Shorthorns today can be separated into two groups-Modern Shorthorns and Heritage "Native" Shorthorns. Originally there was only one herd book for Shorthorns but it was composed of the Milking Shorthorn group and the Beef group. The Milking Shorthorn section focused on dual-purpose with both dairy and beef qualities. In 1949 Shorthorns split into the American Shorthorn Association (ASA) and the American Milking Shorthorn Society (AMSS). Both groups allowed limited introduction of outside genetic bloodlines. This resulted in both Modern Beef Shorthorns and Modern Milking Shorthorns. 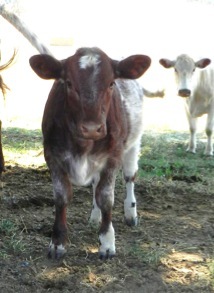 Later the AMSS chose to add the Heritage "Native" designation to preserve 100% pure Shorthorn bloodlines. Currently there are only about 500 Shorthorns that qualify and are registered for this designation in the USA. These select Shorthorns trace to either the original USA herd book or the 1822 Coates herd book. 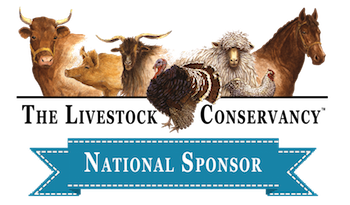 Heritage "Native" Shorthorns are listed as "Critically" threatened by the Livestock Conservancy. Because of our interest in conservation we decided to add a group of Heritage "Native" Shorthorns to our herd. We intend to maintain the integrity of this group while striving to improve their positive "dual purpose" genetic traits. Our original Polled Shorthorns were the modern type--we have built this group, through selection, into a highly productive, consistent herd sustained purely in a grass fed environment. We will be maintaining the separate integrities of these 2 distinct types of shorthorns. We have devoted a lot of time, travel and study to achieving an insight of where the shorthorn breed has been and where certain breeders are trying to take the breed. With over 30 years in the purebred livestock industry and as Veterinarians we have an insight that most people do not have regarding the inter-workings of breed/show manipulations. Purebred Polled Shorthorns have much to offer the beef industry. Essentially Shorthorns can be classified as a maternal breed given their maternal instincts, milking ability, and calm gentle disposition. Unfortunately a movement is afoot to make them something they are not through cross-breeding. This is being done under the guise of improving the breed. There is even a movement to accept black Shorthorns. (Look what this has done to the Limousine and Simmental breeds.) If a breeder wants to raise Angus then raise Angus. The show side of the breed has become dominated by a few select breeders who conduct multiple production sales. Buyers should be aware that show/sale animals are fluffed up, pumped up, and fattened up to the ultimate detriment of their reproductive abilities and longevity. Furthermore with careful analysis of sale results the keen observer will note that if the few high priced individuals are removed from the averages, then prices move down to the more realistic and fair range of $2000.00 to $4500.00. The same breeders who are trying to give the impression of high prices often purchase many of the high priced individuals from each other further affecting price averages. If buyers are only interested in winning shows then they should proceed with a clear view of what they are buying--a "show animal". However if purchasers are interested in being Shorthorn breeders (not just Shorthorn buyers) then they should be looking far beyond show animals for herd additions which can provide productive qualities. A cautionary note regarding EPDs. They are only as good as the truth of the data being entered. When heritability percentages are added EPD's become even more of a "crap shoot".